I’ve come to realise lately, a surprising number of people find housework difficult and turn out not to know things about laundry, unblocking drains etc that I thought everyone knew. It still seems a bit patronising for me to write these tips (but also quite militant in my aversion to dirty tea towels and unrinsed washing up), because they’re obvious to me, but I know now they’re not obvious to a lot of people, and New Year seems an appropriate time to write them. I don’t really find many online cleaning tips that helpful. They’re either aimed at Americans and talk about things you don’t find in British houses and products that aren’t available here, try to convince you that anything can be cleaned with white vinegar and baking soda (tip: sometimes that doesn’t work well), or they’re for the kind of obsessive person who loves to buy special brushes to clean inside blinds. I just want my place looking nice without spending too much time or money doing it. I haven’t recommended many specific products, the generic supermarket stuff is fine. So here’s some tips after the cut, for anyone who wants them. Kitchen cleaners: You only really need a basic spray cleaner for every day use, and some de-greaser for heavier duty. Sink and hob-cleaner also come in handy. What you don’t need is anti-bacterial products loaded with triclosan (unless you are actually cleaning a hospital, which in that case, why are you reading this?). Your house doesn’t need to be sterile. I have dry skin, and always use rubber gloves for cleaning and washing up. If you do use gloves, make sure to use different ones for kitchen and bathroom, as cleaning your kitchen with the same ones you use for the toilet is really unhygienic. Sponges and cloths: Manky old sponges and clothes just spread muck everywhere. Don’t use the same sponge for washing up and cleaning surfaces, it’s incredibly unhygienic. Use clean tea-towels and put manky stained ones in the wash. Cleaning work surfaces: Wipe off any crumbs, then use a hot, clean, wrung out cloth, and a small spray of basic kitchen cleaner, and quickly wipe down the surfaces. There should barely be any water on them. If you have gloss surfaces, dry them down with either a clean teatowel or some kitchen paper to avoid streak marks. It should take no more than a couple of minutes, and will leave the surfaces sparkling. The secret is the hot cloth. Too many people leave a big pool of luke-warm or cold water lying around, that takes forever to dry, and leaves a tide-mark. Washing up: Leaving the soap on things means you’re leaving the dirt on. For god’s sake rinse things. Also wash them up properly to start with, and don’t even think of using a grubby tea-towel to dry anything. If your drinking glasses don’t sparkle, they either weren’t washed enough, or not rinsed enough. To remove stains from the bottom of mugs, spray a little kitchen bleach inside, wait 10 minutes and then wash as normal (making sure of course to rinse thoroughly). Fridges and food hygiene: I think most people know to not use the same chopping boards for raw meat and vegetables. You also shouldn’t put (open) raw meat at the top of the fridge, because it can drip blood onto other food and contaminate it. Personally I don’t like to keep fruit and veg in the drawers at the bottom, as I feel like they just end up going off there much easier unseen. Every so often, you should take the glass shelves and door shelves out of the fridge and give them a wash with washing up liquid, and wipe the inside of the fridge down. It’s so much nicer to get food out without thinking “ugh, what was that sticky residue”. You should also check that the drain at the back of the fridge isn’t blocked, as that can lead to the fridge flooding. A fridge freshener is also a good purchase- it’s a little tub of gel that absorbs any bad smells. Oven hoods: A lot of grease and glued on dust lurks here. Some degreaser and elbow grease will remove it. Hobs and ovens: A clean hob without manky bits of old food makes your life feel nicer. You can buy a special cleaner for the heating pads of electric hobs. Oven cleaner is nasty stuff, and you should open the windows and follow the instructions carefully. Sinks: Having a clean, shiny sink also makes your life nicer. Ceramic ones are just cleaned with standard kitchen spray, and stainless steel ones use a special cream for steel. If your landlord has kindly left you one of those beige plastic sinks from the 70s or 80s that picks up every tea stain, then you can clean it by spraying kitchen bleach, leaving for half an hour, and then rubbing it with a sponge. 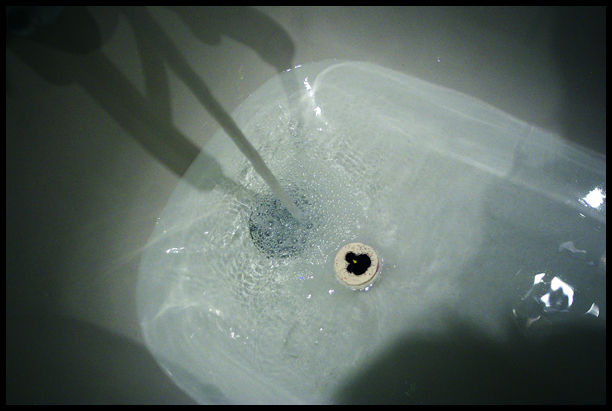 If the water doesn’t drain well, or the plughole smells, then you need to unblock it. Drain cleaner, waiting 30 minutes, then pouring a kettle of boiling water down will do the job. Drain cleaner is nasty stuff, so follow the instructions carefully. Descaling: Kettles need descaling regularly if you live in a hard water area. You can buy a sachet that you boil inside to remove the limescale. I usually wear gloves to clean the bathroom, as some of the chemicals are bad for your skin. If you use gloves, make sure to use different ones for kitchen and bathroom, as cleaning your kitchen with the same ones you use for the toilet is really unhygienic. Sinks and baths: Just use some simple spray cleaner, and a hot, wrung out sponge or cloth to make them shiny and dry quickly, and then rinse. If you have a nasty scummy ring on there, use something stronger like Cilit Bang. Descaling: If you live in a hard water area, limescale will cling to everything, and block up your shower head. Unfortunately the only way to remove it is with strong cleaning products and some elbow grease. For tiles and shower doors, use spray descaler and the green scourer side of a sponge. To descale a shower head, soak it in a plastic bag or ice cream tub of descaling solution for the recommended time, and then give it a good scrub. Toilets: Obviously not having a disgusting toilet is a good way to make your life happier. Make sure to clean under the seat properly. You can buy toilet cleaning wipes that claim to be flushable, but don’t flush them, because whatever they claim, they do block up pipes. I used to use those blue cistern blocks which keep cleaner flowing through the toilet. I’m not sure how good they are for the environment though. Whatever you use for the toilet, don’t clean your sink and shower with the same sponge/cloth/whatever, as it’s not exactly hygienic. Black mould: Unfortunately we live in a cold, damp climate in the UK, and unhealthy black mould likes to appear in bathrooms. The only way to get rid of it is with strong bleach and elbow grease. Carpets: Hoover them regularly obviously. Hoovering does a surprising amount to make a room feel nicer. With carpet foams and powders, it’s best to stick to the neutral-scented ones and use them sparingly, because a lot of the scented ones have really sickly artificial smells that linger forever. Hard flooring: Washing it once a week makes a massive difference. A lot of people don’t seem to know how to mop well. They spend a long time sloshing a load of cold water all over the place, which then takes forever to dry and turns into a huge production. The correct way is to boil a kettle of water, add it to the bucket along with a capful of floor cleaner, and then wring the mop out as much as possible. You can then wash the floor in a couple of minutes with the hot mop, and it dries quickly and with a shine. For wooden floors I like the Ecover floor cleaner, which has linseed oil in, and smells delicious. Hoovers: A lot of rented houses come with a bagless hoover that has not been treated well. (Personally I have a Henry that I’m really pleased with). Washing all the bits, and taking the sponge filter out and washing it makes a big difference to how manky the hoover is. Vacuums shouldn’t smell bad. You can also get an air freshener for hoovers you put inside the chamber/bag. Dusting: Dust makes you sneeze and makes allergies worse, and electrical items attract it. The best way to get rid of it is with some simple spray polish and a yellow duster. Glass and mirrors: The main way to get these sparkling is with a tiny amount of glass cleaner, newspaper and lots of elbow grease. If you use too much cleaner, don’t buff it enough, or use the wrong sort of cloth, it will be smeary or have fluff stuck to it. Having clean mirrors makes a bathroom look a million times better. Keeping the place clean should keep it smelling nice. I’m not a fan of the sickly artificial fragrances you get in those plug-in air fresheners, they give me a headache. I like candles however, but my number one tip for your house smelling good is an essential oil atomiser. I used to have the Muji one, and then when it wore out, I replaced it with a cheaper one from Ebay. You fill a chamber with water, add a few drops of essential oil, and then it uses ultrasonic vibration to turn the water into a scented mist. Anyone who’s been in a branch of Muji knows how good they smell. I normally use lemongrass, cedar and bergamot oil together. Good bedding and towels (which are changed/washed often) make your life much more enjoyable. Especially with pillows, people tend hang on to old ones that are threadbare and lumpy. Nice new pillows immediately make your life better. TK Maxx is an excellent source of high-quality housewares. Detergents: Laundry detergents can be one of the worst culprits for allergies. I find ones with lots of soap, perfume and optical brighteners really aggravate my eczema in the winter. I can recommend Ecover for people with allergies. If you’re not allergic, they’re much of a muchness. Fabric conditioner: It’s a good idea to use a small amount fabric conditioner to make your clothes feel soft, and avoid that cardboard effect when they dry, but if you use too much it will give a slimy feel to the clothes. Strongly perfumed conditioners can also be an issue for people with allergies. Separate light and dark items into separate loads, and use a dye absorption sheet with items like jeans (You can buy packets of them with the detergents for £1-2). This stops the loose dye that comes off them for months after purchase staining anything else. 60ºc– bedding, towels, teatowels (also optionally underwear, socks and gym clothes). This temperature removes dust and dead skin. cold- woollens and fragile vintage items. Use special detergent for delicates rather than the standard stuff. Not all washing machines spin the clothes enough. They should barely feel wet when you take them out. If they feel noticeably damp, give them an extra spin cycle, and then they will take much less time to dry. If your clothes are taking more than overnight to dry in the winter or smell damp, then you’re taking them out too wet. To remove blood: wet the item with cold water, and cover the stain in salt and leave for a few hours. Then use normal stain removers. To get rid of smells on gym clothes: Add some baking soda to the wash. Fabric conditioner and synthetic sports fabrics also don’t mix well. You can also presoak it in warm water with white vinegar added. Cleaning the washing machine: Limescale and residues can build up in the washing machine. If it has a smell (washing machines shouldn’t smell of anything) or you feel that it isn’t cleaning things properly, you can buy a packet of powder you run through the empty machine on a hot cycle, which cleans it. You also need to wipe down the inside of the door and the rubber seal, and take the detergent tray out and wash it every now and then (also check there is nothing nasty lurking inside the rubber seal). There shouldn’t be gross old soap residue in the detergent tray, it attracts black mould easily, and all that nasty old gunk is getting rinsed through onto your clothes. Tumbledryers: Obviously they are very convenient, but also bad for the environment and wear your clothes out faster. Never tumble-dry woollens either, unless they are horribly stretched out and you deliberately want to shrink them. Please, please clean out your lint tray frequently. Old fluff and dust lurking in there catch fire easily. If the dryer is one that condenses the water vapour into a tub of water, you also need to empty and wipe down the tub regularly, as it is a target for black mould. Ironing: Some washing machines crease clothes up so badly you have to iron everything, and some of them don’t. Might as well iron it rather than look a mess. If you live in a hard water area, it’ s a bad idea to use tap water in the iron, as it will crust up the inside with limescale, and stop it working. You can buy plain or scented ironing water, which will keep your iron in good condition. If the sole of the iron is dirty or sticky, you can buy a cleaning stick that you rub on, heat up, and then rub off on paper.